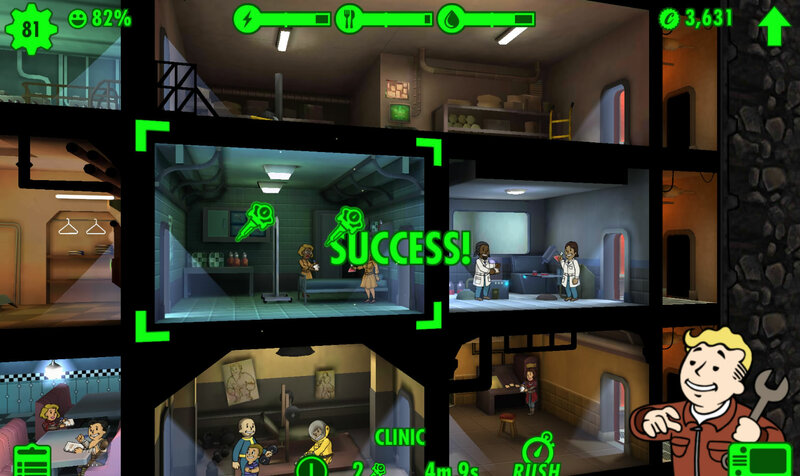 Since the release of Fallout Shelter for Android, I’ve been spending far too much time overseeing my vault and trying to make my dwellers happy. It’s a really fun and casual game, but it does take quite awhile to build everything, and when you finally get your resource production in order you will inevitably run out of caps (money in Fallout games). The best way to get caps in Fallout Shelter is of course rushing rooms. Every rush though has a certain chance of succeeding, but failing a rush can mean your dwellers will lose health due to fire, radroach infestation, or worst of all mole rats. A bad mole rat attack can really ruin your day and kill several dwellers which can get costly, and if you’re out of caps it means you will be losing out on resources. Paired with a badly timed raider or Death Claw attack on your vault this can completely devastate your meticulous planning, and in the end it can take an hour or more to recover. I discovered there’s a better way to keep your dwellers happy and healthy, and get tons of caps in the process. Be warned! This “tip” only uses a certain clever game mechanic I discovered almost by accident, but could be considered cheating or exploiting and could ruin your fun with the game! Essentially you still need to play the game as you used to but you’ll just be getting caps a bit faster. And as a consequence, you can avoid getting attacked by Mole Rats, Raiders, or Deathclaws. Upgrade the Clinic so it produces 2 Stimpacks instead of one. Put in two dwellers with highest intelligence and luck you can find. Equip both dwellers with a weapon. Keep Rushing production until your dwellers are at half health or so, then use one stimpack on each one to heal them back up to full. Keep Rushing production, heal them again, and repeat as many times as you like. There are a few things to remember. First, make sure the Clinic room is 1×1; don’t combine two or three Clinic rooms! Bigger rooms means more radroaches will spawn and fires will take longer to put out. Your goal here is to maximize caps and the best way to do it is to have the smallest room. Just make sure you upgrade it first so you’re getting at least as many Stimpacks are you’re spending. You will of course fail a lot of Rushes, but every three or four tries you will succeed and get caps based on your fail chance: if you have a 78% chance to successfully rush a room, you will gain 78 caps as reward assuming you are successful. In the end you will be getting more caps than rushing other rooms as you normally would. Of course, just make sure there’s enough dwellers assigned to get you plenty of food, water, and power from other rooms. You can finally stop worrying about high incident chance. 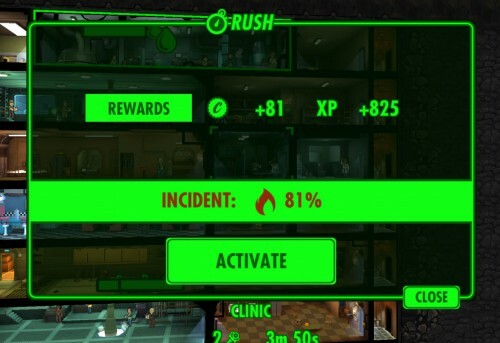 Failing a rush will spawn either Radroaches or Fires each time, and every 3 or 4 fails you will have to heal your dwellers who will be taking damage. However since this room is producing medpacks constantly you can heal your dwellers with just a couple of clicks whenever necessary. Another very important thing to keep in mind: never build this room next to dirt. Make sure it’s surrounded by any other rooms at all sides. This will make sure Molerats will never spawn, as they are much tougher and take longer to take out than Radroaches. 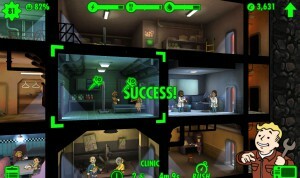 Lastly make sure they dwellers you assign to this Clinic aren’t pregnant, as they won’t fight enemies or put out fires. Make sure you equip them with weapons though, and best Intelligence and Luck armor you have (something like Librarian Outfit). From my testing both Intelligence and Luck determine the maximum failure chance, and you want to keep it as low as possible (but don’t worry it it’s even around 85%). I was doing it with 84% for several hours (it will never go to 100%). Even with a higher chance to fail you’ll at least be getting more caps, so it doesn’t really matter. I once asked a librarian if she wanted to see a radroach. It didn’t go well. Here’s the kicker though, and another amazing benefit to doing this trick. While doing this today for about 4 hours in total (yeah, I need to get a life) there were zero random radroach attacks in other room, no sudden fires, and no Molerats burrowing their way into my vault. In fact it gets even better: there were no Raider or Deathclaw attacks either! I’m still unsure what triggers any of the above attacks, but none of it happened during my repetitive Clinic rushes. I’m assuming there’s a limit to the number of attacks that can happen in a certain time frame, and you’re practically fighting once a minute if you keep rushing the same room over and over again. If you have any insight, feel free to submit it in comments below. As I mentioned at the start of this guide, I discovered this trick almost by accident. I had an Objective to put out 24 fires for a Lunch Pack (I love those), so I figured I’ll just keep rushing the same room over and over again. After awhile it seemed like rushing Medbay made most sense since I needed Stimpacks to heal my dwellers. It was pretty easy to reach the conclusion I could do this for as long as I liked. In the end it’s up to you whether to use this trick or not. 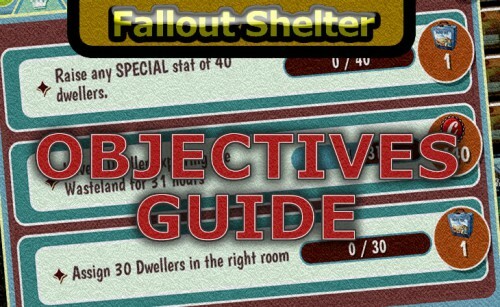 Even though it’s not a drastic game-breaking “cheat” you might expect, it’s still surely not how Fallout Shelter was meant to be played and can ruin your enjoyment of the game. Just mindlessly clicking that “RUSH” button for hours is bound to get boring, so if you take advantage of this trick I’d recommend you do it in moderation.